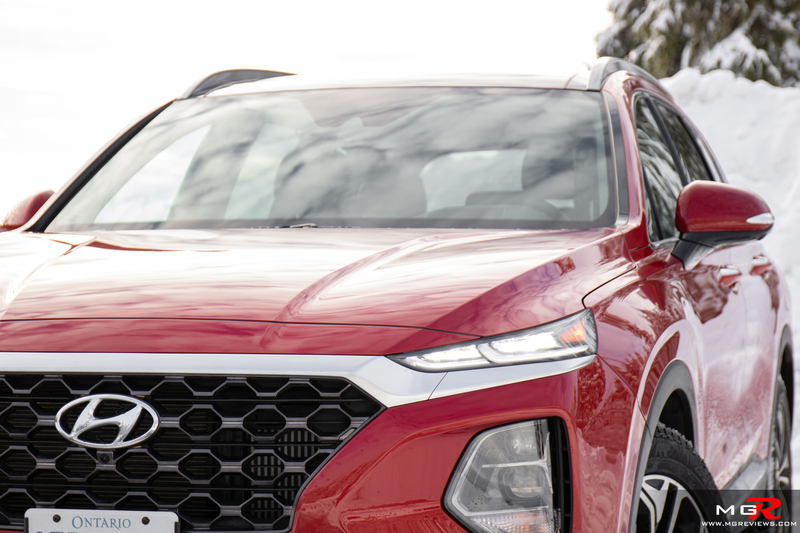 The Hyundai Santa Fe has been completely redesigned for the 2019 model year. 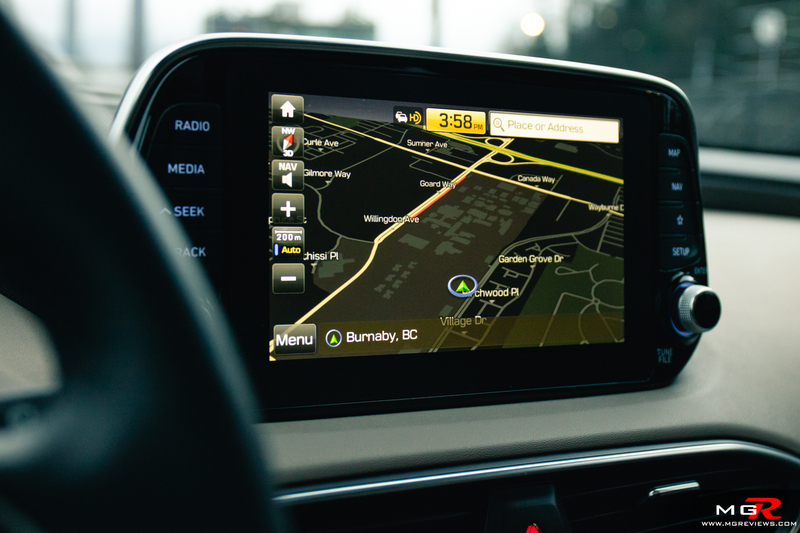 It has new looks both inside and out, it offers more space, and comes with a bunch of features as standard. So how does it stack up to the current king of the two-row SUV market, the Honda CR-V? Engine – A 2.4L naturally aspirated engine is the base engine while a 2.0L turbocharged inline-4 is available as an option. This Ultimate trim comes equipped with the latter and it produces 235hp and 260 lb-ft of torque. On paper, the power figures look promising. But in reality, the Santa Fe feels underpowered even with the more powerful engine. 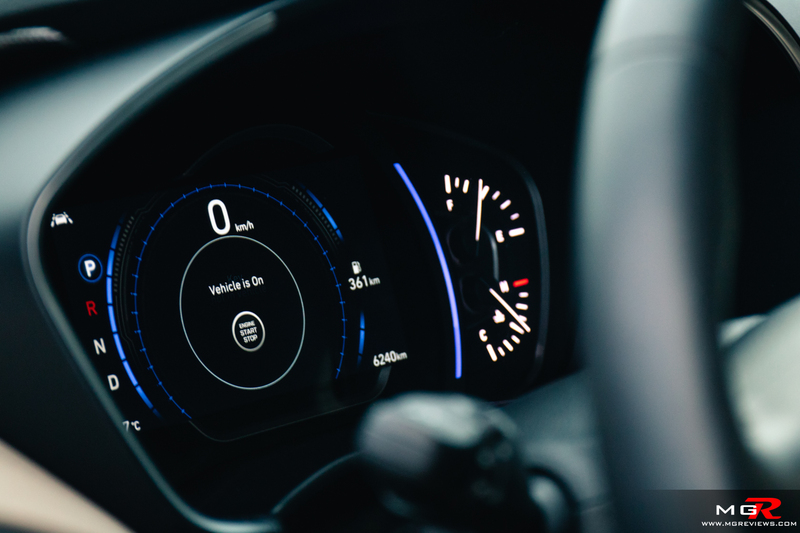 There are different drive modes that you can select from (Comfort, Sport, Smart) and changing to the Sport mode does help, it also uses more fuel. 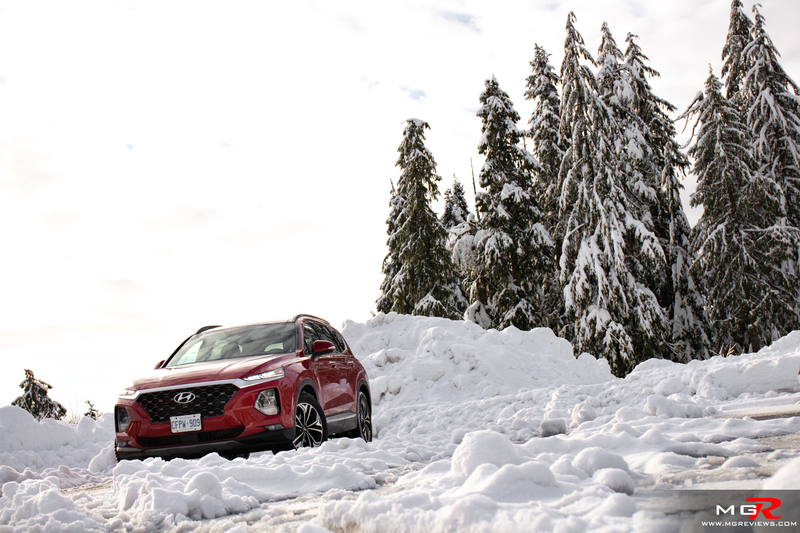 During my week with the 2019 Hyundai Santa Fe, I was fluctuating between 11.7 and 13.2 L/100km over a roughly 350km overall drive that included both city and highway driving. However, a plus is that Premium fuel is not required with this turbo engine. Transmission – An 8-speed automatic does the job of transferring the power to all four wheels (or the front wheels with the 2.4L engine). As far as transmissions go, this one is smooth whether it’s on a cold morning or after a long, hot drive. 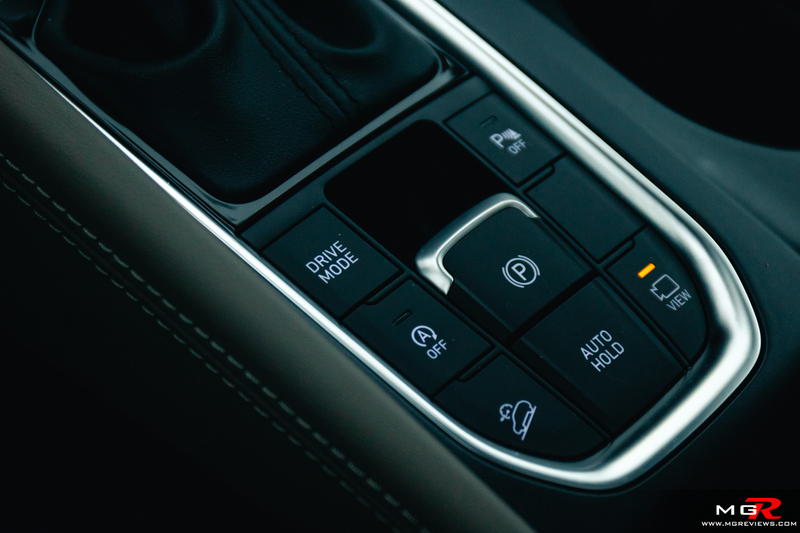 Just don’t expect the manual mode on the transmission to be quick with driver inputs… because it isn’t. Braking – Coming to a stop doesn’t take much effort despite the hefty 1,850 kg weight of the Santa Fe. The brake pedal doesn’t feel as firm as that on the Mazda CX-5 but it is easy to modulate for smooth deceleration. 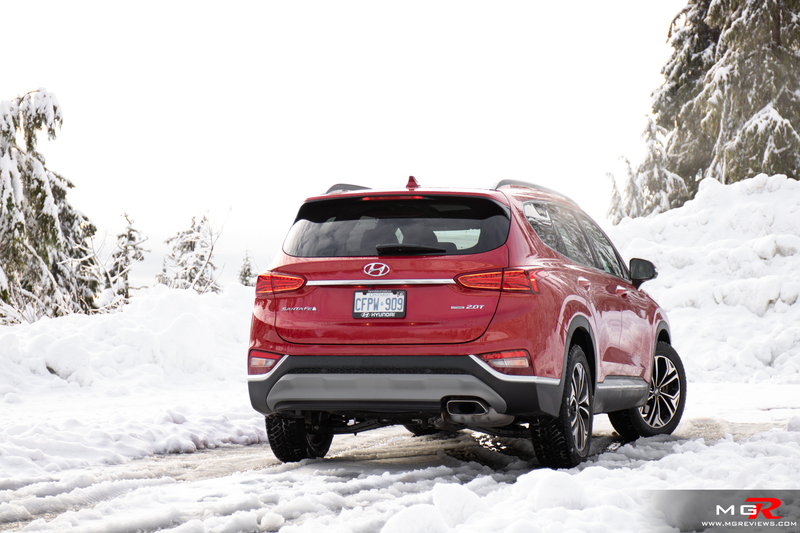 Handling – Compared to other SUVs in this class, the Hyundai doesn’t provide the same enjoyment. 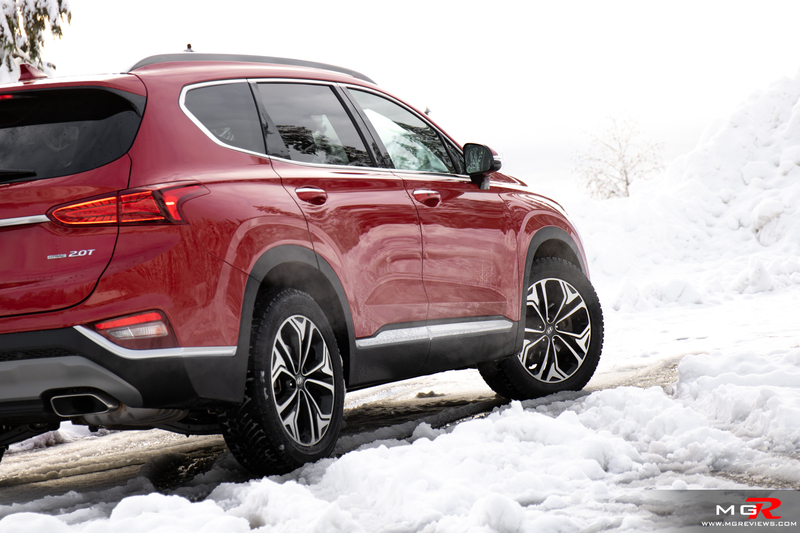 It’s not going to slip and slide around every corner or anything like that, but it’s not that engaging behind the wheel as the Honda CR-V or the Mazda CX-5. In terms of outright grip, it’s pretty good. As you can see from the pictures, I took it to a local mountain and I never had to get out to dig the car out of the snow. 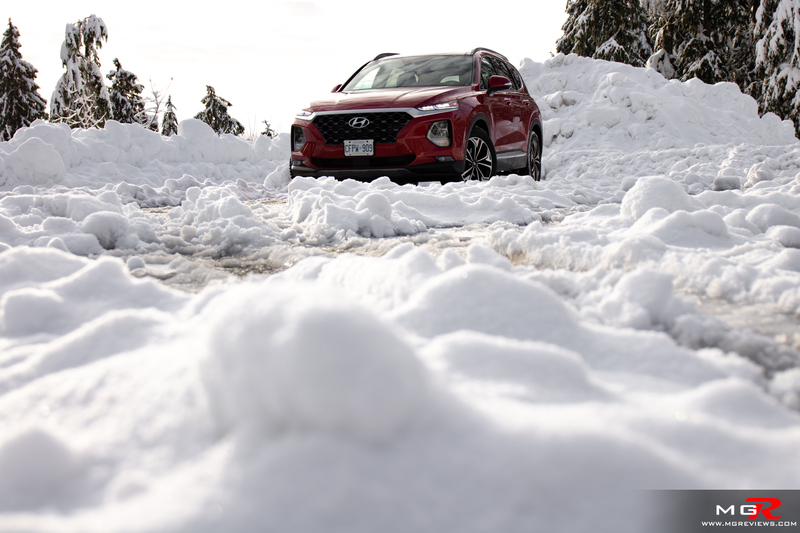 The Santa Fe also has a 4×4 lock which provides power to all four wheels in slippery or snowy conditions. 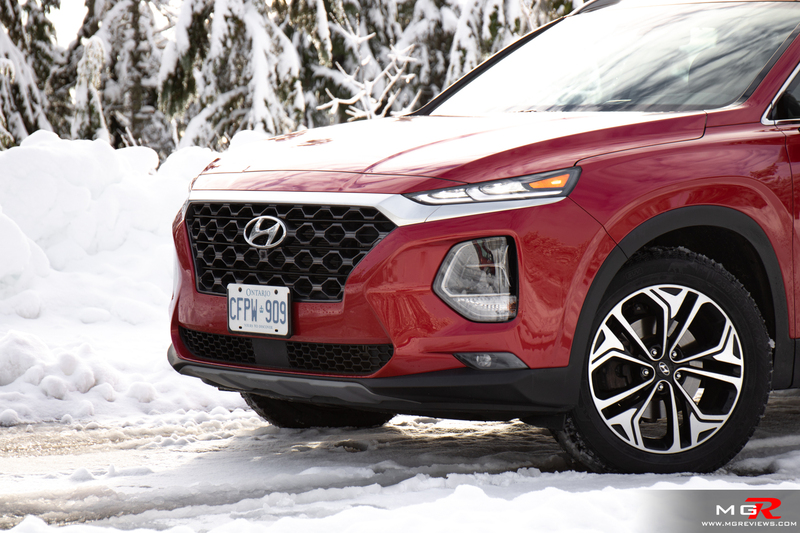 Ride Comfort – Where the 2019 Hyundai Santa Fe really shines is at being a family SUV. The suspension is supple and provides a smooth ride whether on city streets or boring, long highways. 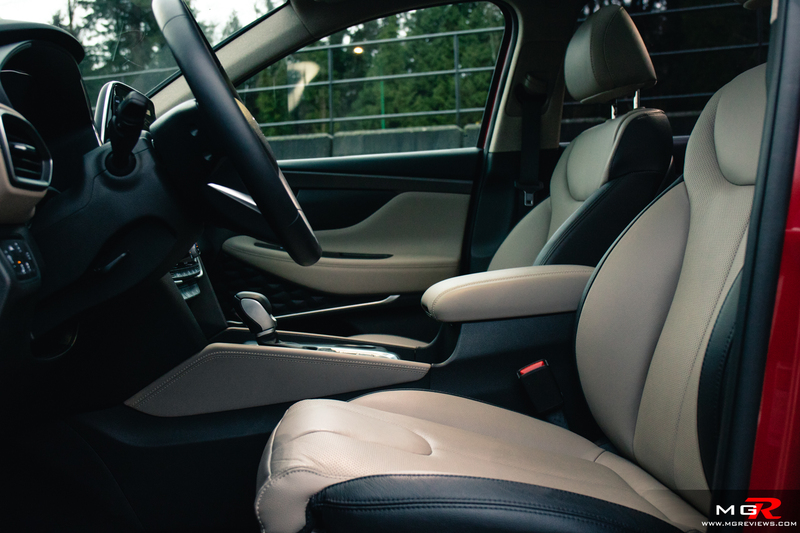 The front seats have soft cushions and offer enough adjustability regardless of your height. The rear seats can slide forwards and backwards and also have some recline adjustability. 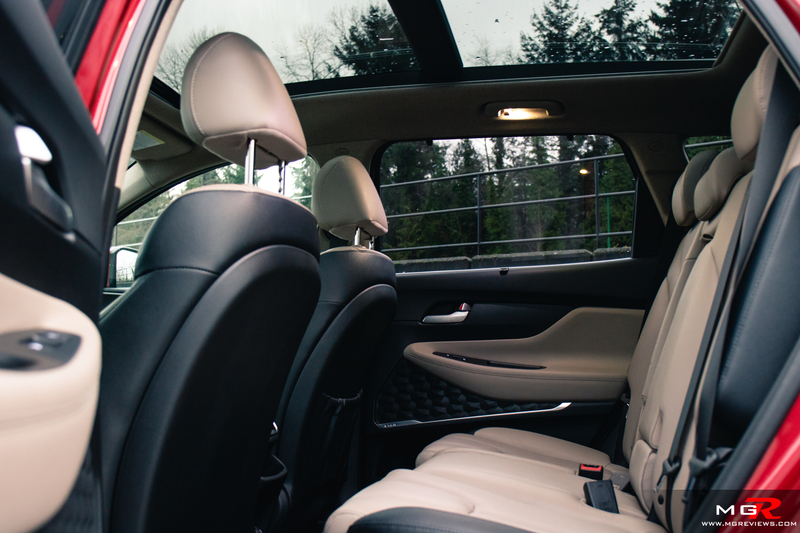 Interior Space – There is an abundance of space inside the Santa Fe and not just for the front occupants. The rear occupants also have a lot of leg and head room. This is due partially to the larger dimensions of the Santa Fe but also because a 3-row Santa Fe will eventually be available. 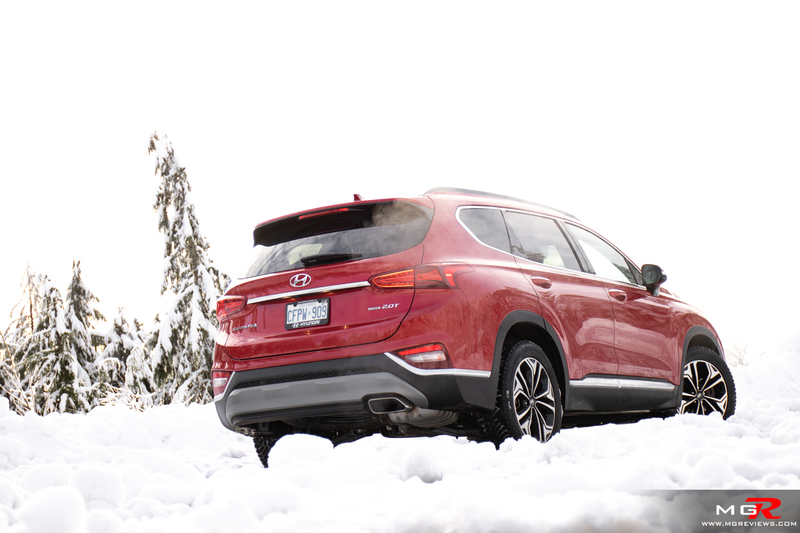 So to reduce costs, Hyundai developed the Santa Fe platform with a 3-row SUV in mind. 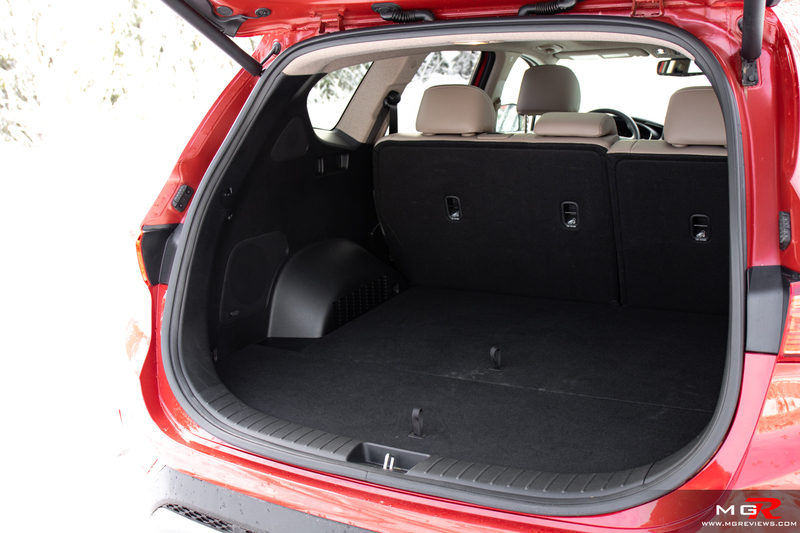 Right now in this 2-row SUV, the trunk is large and there are a lot of storage bins underneath the floor where the 3rd-row seats would go. 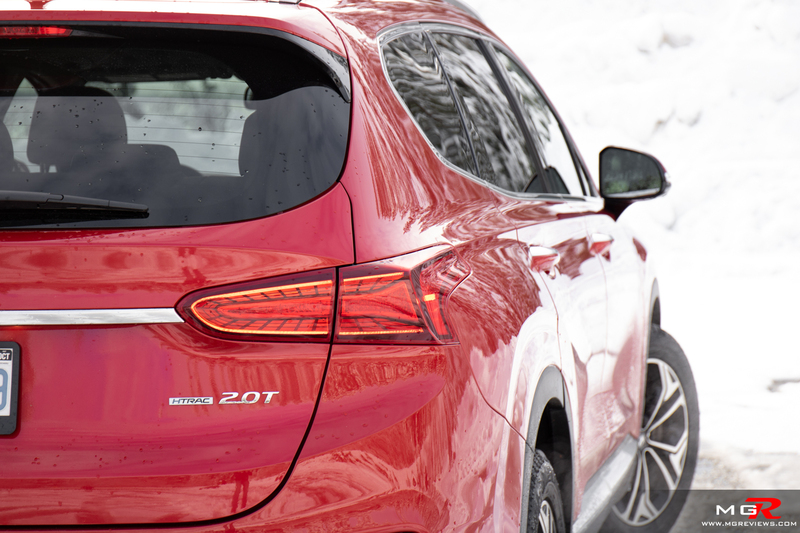 Noise, Vibration, & Harshness – It is very quiet in the Hyundai Santa Fe. Driving on a highway barely requires you to raise your voice to have a conversation inside the SUV. Engine noise is also subdued even when revving past 2,500 rpms; the usual range where engine noise becomes obtrusive in other vehicles. 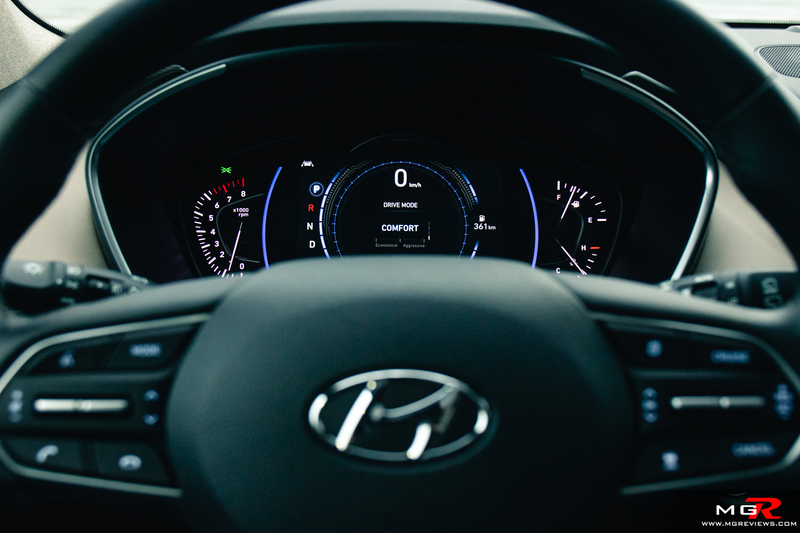 Interior Design – The 2019 Santa Fe has a similar layout to other current Hyundai vehicles. 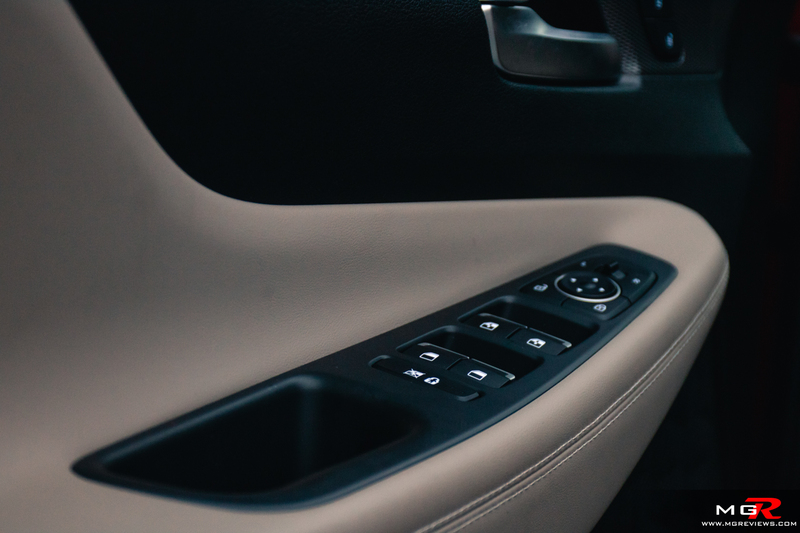 The “floating” touch screen is flanked by physical buttons for quick access and the climate control also has physical buttons making it very easy and quick to adjust. Overall materials are pretty good for the amount of money that you’re paying but some of the lower panels around your feet are cheap, hard plastics. 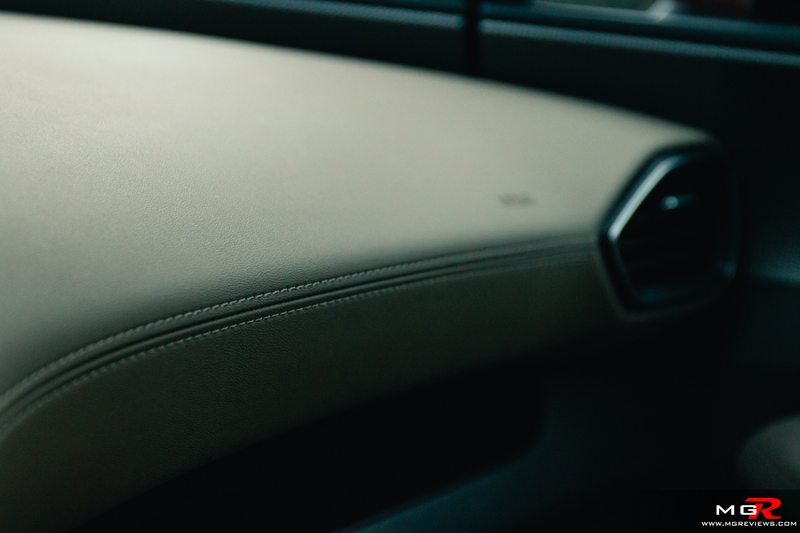 A couple unique touches are the quilted looking stereo speaker covers and the tweed looking headliner. I’m not too fond of the tweed headliner but I do like the quilted looking speaker covers. 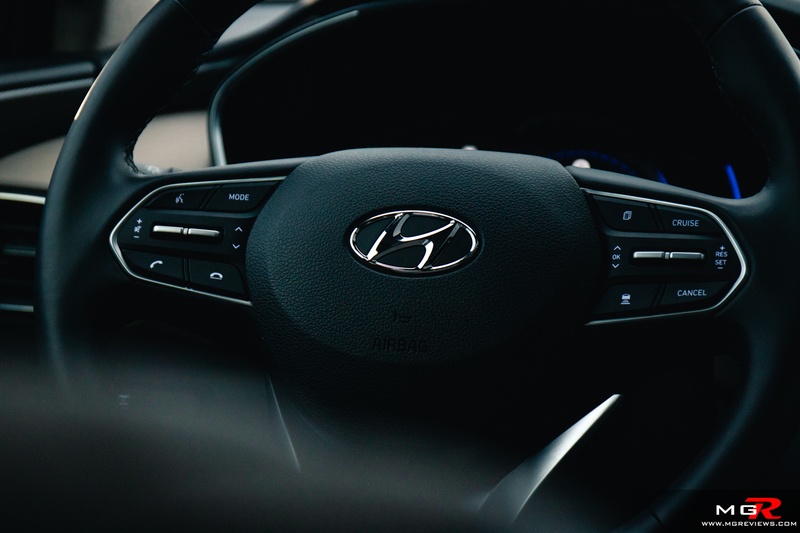 Gadgets – This being a Hyundai product, you’re getting a lot of features for not much money as compared to other brands. 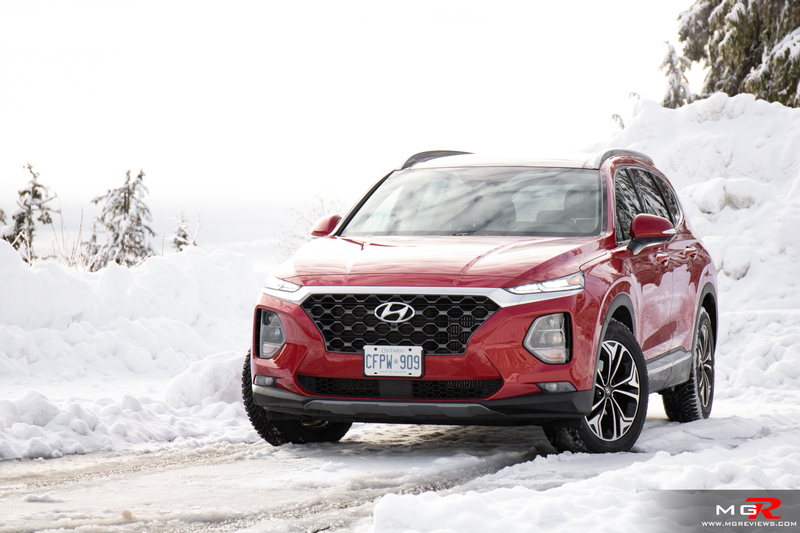 In its most base form, the Santa Fe comes equipped with Apple CarPlay and Android Auto, heated seats and steering wheel, a backup camera, and leather wrapped steering wheel among others. Not too bad for $29,000 CAD. For $45,000 CAD you can have this Ultimate trim which comes with a bunch of stuff. 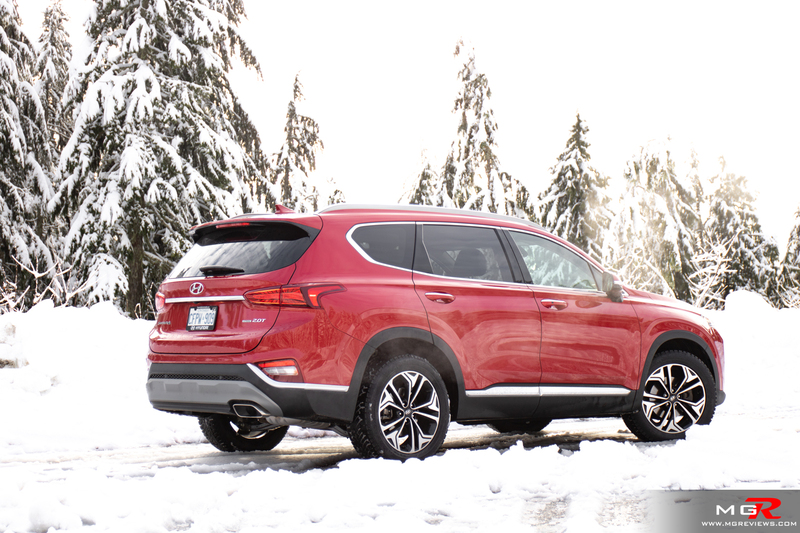 Most notable is the 2.0L Turbo engine, Navigation, Heads-up display, wireless phone charging, panoramic sunroof, surround view cameras, and all of the safety features that one would expect from a 2019 IIHS Top Safety Pick Plus SUV. A couple things to note though on the gadgets are that the automatic wipers are not the best at detecting rain and they cannot be switched to a manual/intermittent mode. 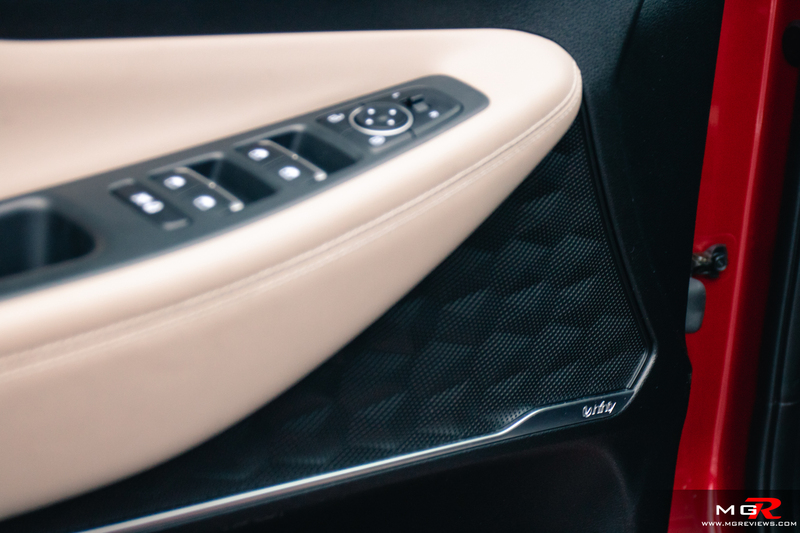 The other feature to note is the new Safety Exit Assist which is supposed to alert you and lock the doors if a vehicle or cyclist is coming up behind you (when parked) as you try to exit the vehicle. I tried this feature and while it did alert me of a vehicle coming up as I was opening the door, it did not lock the door preventing me from opening it and hitting the car that was coming behind me. Maybe I was just using the feature incorrectly or it was faulty, I don’t know. 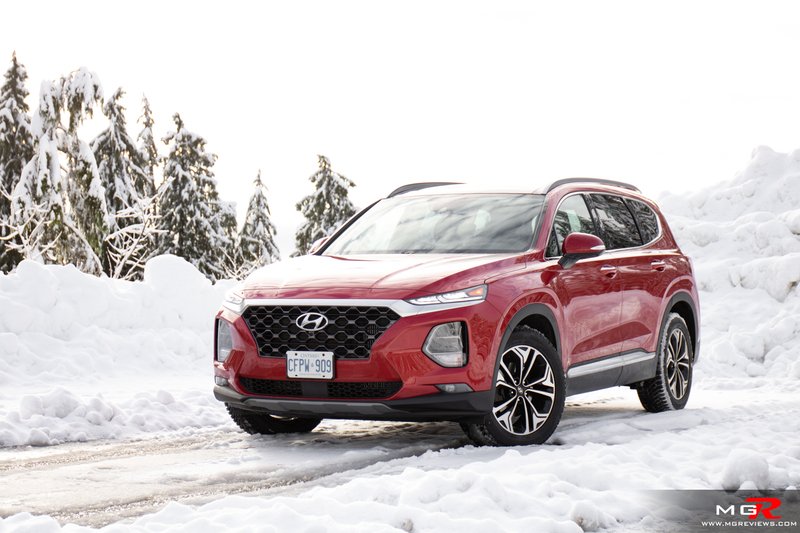 Exterior Design – The Hyundai Santa Fe follows the same styling cues as it’s smaller brother, the Kona. It has the similar diamond-like shaped grille and squinty daytime running lights above the normal headlights. Around back, the tail lights are LED in this trim and have a 3D look to them. From the side, it looks just like any other SUV and I know that there isn’t really much that designers can do about that. Overall, in my opinion the Honda CR-V is still holding on to its crown. It’s a better overall family SUV. 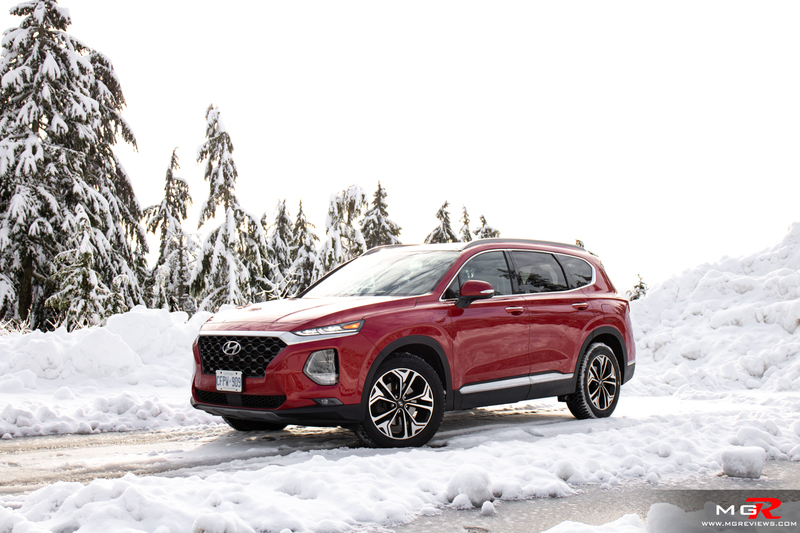 The 2019 Hyundai Santa Fe however is a great alternative. It is a bit more expensive than a comparable CR-V but less expensive than a comparable CX-5 and bigger.